This is Louie, a male 2-year-old Standard English Bull Terrier doing one of his favorite things, jumping through the air trying to bite the spraying water. …And also loves to go rollerblading! Shasta, a Pit Bull / Lab mix (Labrabull) hanging onto her toy. Isabelle is a 7-month-old Silky Terrier who lives in Texas. 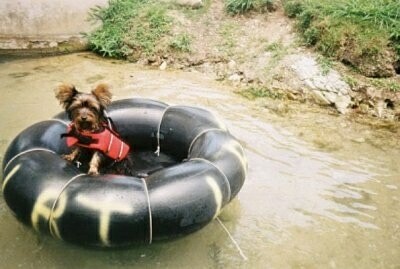 This past August she took a trip to New Braunfels, TX with her family and tubed down the Comal River several times. 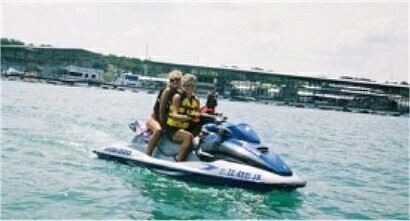 She also enjoys riding on the Jet-Ski at Canyon Lake!